IP Result of anti-PLK2 (IP:15956-1-AP, 4ug; Detection:15956-1-AP 1:300) with HeLa cells lysate 2480ug. PLK2(Polo-like kinase 2) is also named as SNK and belongs to the Ser/Thr protein kinase family. It plays a role in normal cell division. 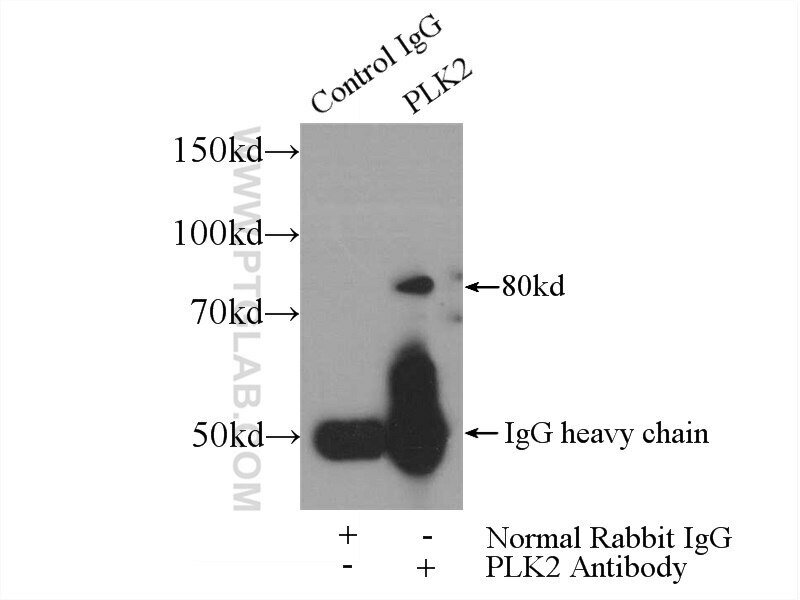 Plk2 expression is detected only in G1, and endogenous Plk2 is rapidly turned over. Therefore, the expression of the three mammalian Plks during the cell cycle resembles the successive transition of the cyclins, prompting speculation that Plks may reg-ulate the cell cycle in a manner analogous to that of Cdks(PMID:12972611). MicroRNA-27b up-regulated by human papillomavirus 16 E7 promotes proliferation and suppresses apoptosis by targeting polo-like kinase2 in cervical cancer.